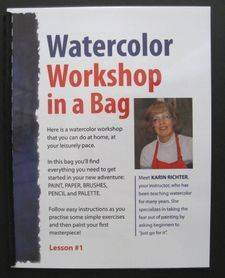 The Watercolor Workshop in a Bag © allows you to learn and paint at your pace and at your leisure. do skies, mountains, trees and more in one easy to follow session! Order a bag for yourself or give the gift of art to someone you know! 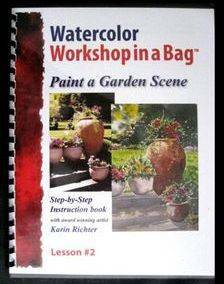 Click on "Add to cart button"
The Watercolor Workshop in a Bag © now has a second lesson. A Garden Scene where garden and floral elements are introduced. Click on the "Use other credit cards" if you do not have a PayPal card!